As you all know, I started this blog because I’m self absorbed I love sharing new finds and products I love. 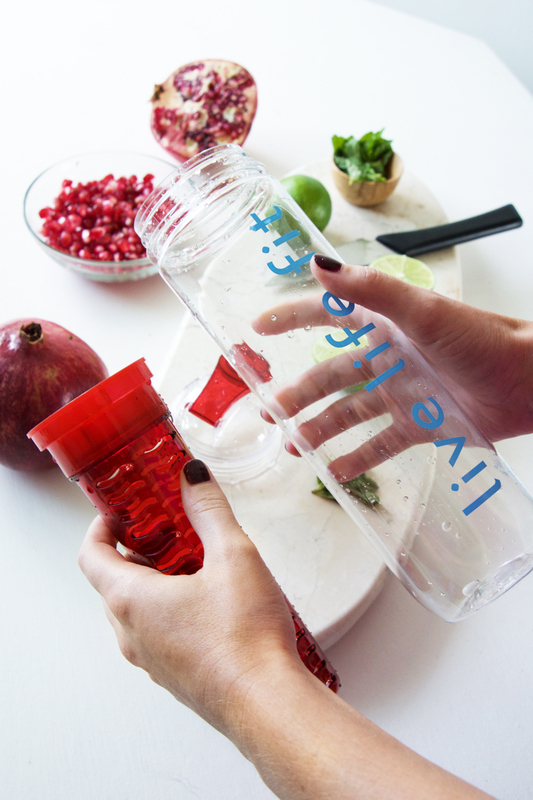 Today I’m featuring a fun new find that has become my newest fitness/life must-have. 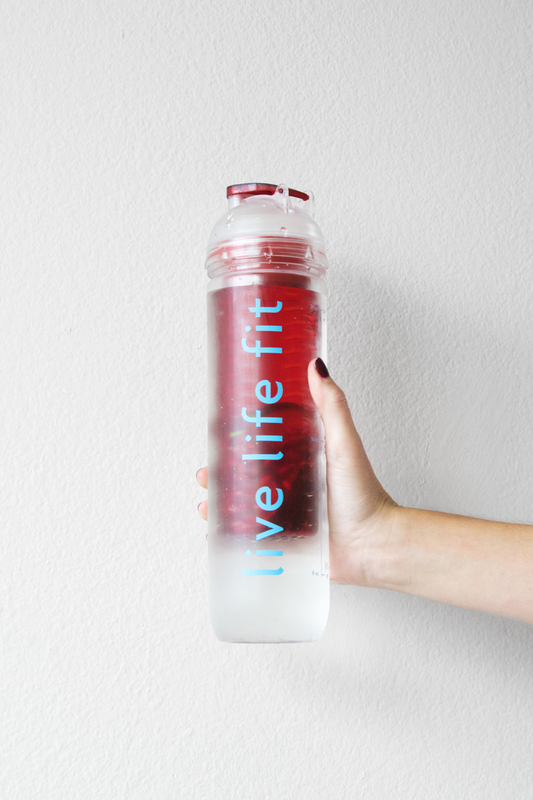 This past year, my life has been so much more on-the-go; I’m almost always carrying a reusable water bottle with me. I have a couple in my car, some at home, and one in my gym bag. 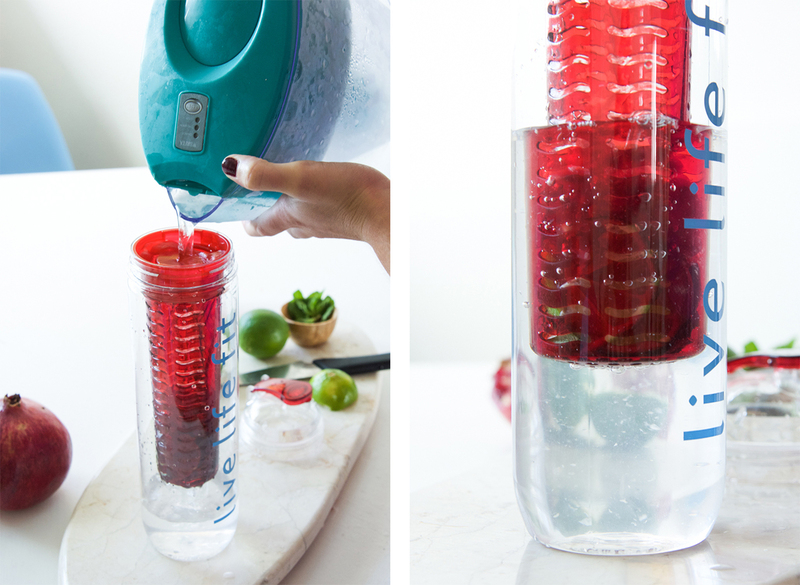 And while regular, good ol’ h2o is amazing on its own, I was recently introduced to fitlosophy‘s solution to portable spa water: the fitfuser. *Upgrade! * It’s like the Four Seasons of water bottles, whereas I’ve been over here at the Holiday Inn with no delicious flavors in my water. You might be thinking, “portable spa water? hotel analogies? you’re a joke,” but seriously, just try it, it’s amazing. Also, I know, but you don’t have to be so rude about it. The second I got mine in the mail, it was like opening up a Pinterest board in my mind: I was teeming with ideas… what kind of combinations could I create? My yoga studio actually has an infused water dispenser at the juice bar, and my favorite combo of theirs is the vanilla bean & orange (details at the bottom of this post). But I wanted to get creative… with the holidays around the corner, I opted to create something a little more festive. 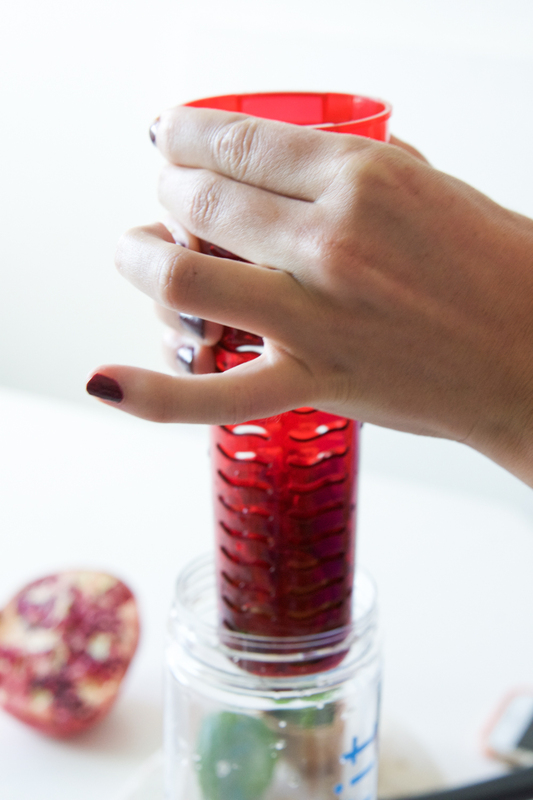 The bottle has four parts: the lid, the infuser, the infuser lid, and the bottle. I took it all apart so I could make sense of the contraption before I embarked on my culinary journey. 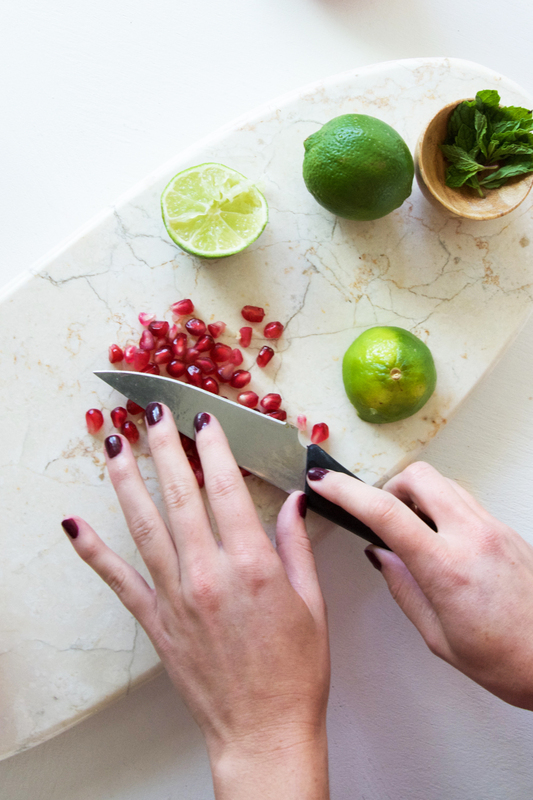 After cutting up the pomegranate, I grabbed a handful of mint, and sliced up the lime . 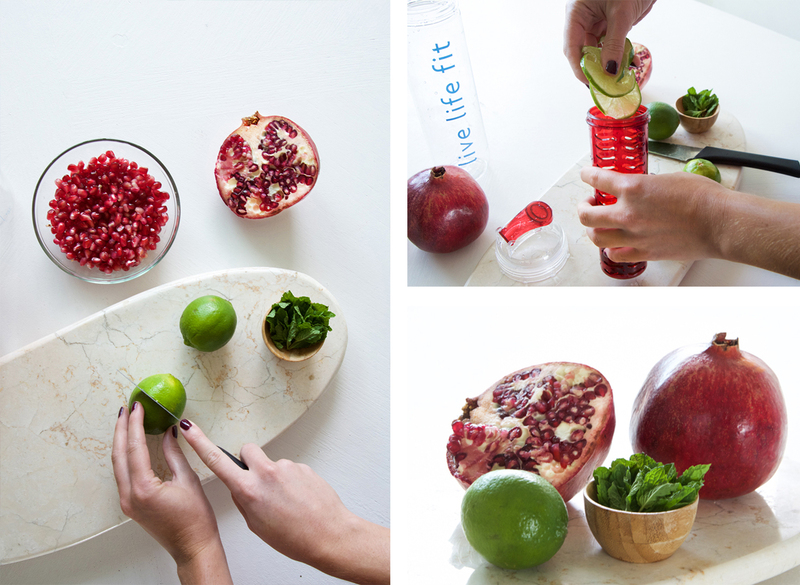 top right: approximately 5x the lime you’ll actually need. I learned the hard way. – smack your herbs (sounds weird, yields great results) to release the flavor more. Just like, put the leaves in your hand and do a heavy golf clap. I felt awkward doing it but it worked. Non-pro tip from me: don’t overdo it on the lime. 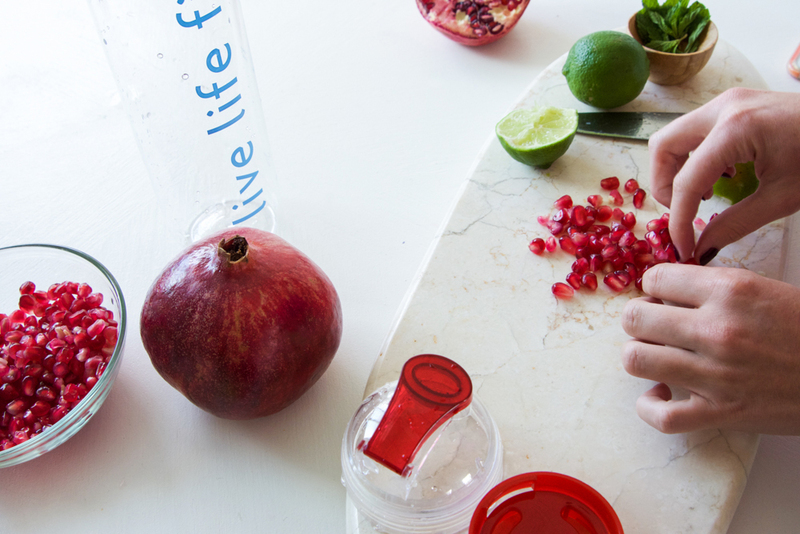 You’ll want to crack the pomegranate seeds slightly with the flat side of a knife, so they break open a bit and let the juice out into your water. Add more than you think is necessary… it takes quite a bit to make it flavored. *note: don’t smash the seeds so the juice gets everywhere; just crack them a little – it’s not messy, I promise! 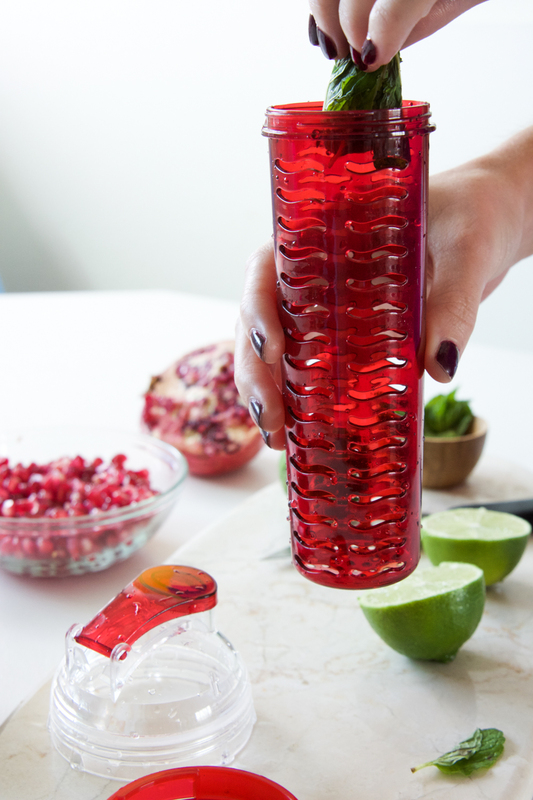 Once you’ve got all your ingredients dialed, throw all dat stuff in your infuser and drop it back into the bottle… ...fill it with water… …. and bam! Fancy water. Just what you’ve always dreamed of, right? 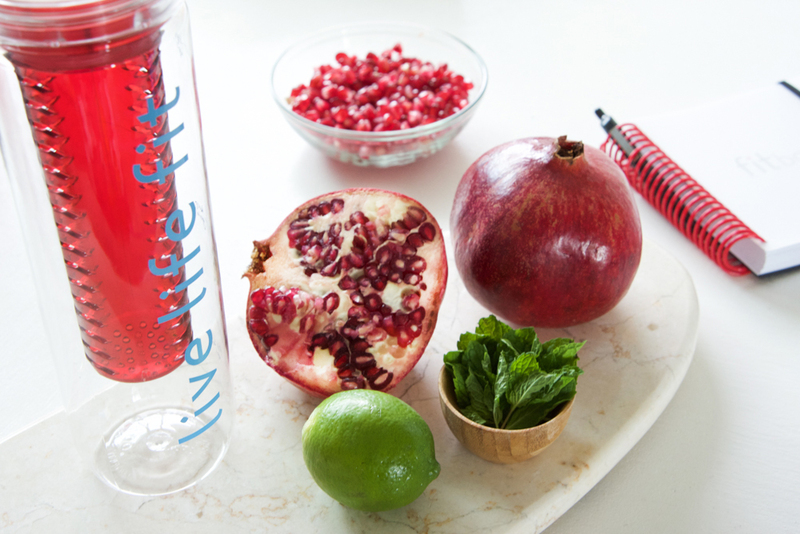 Have fun experimenting with flavors! I’m also excited try different ingredients with different health benefits… like something with lavender for a deep relaxation yoga class, or more energizing citrus fruits for a spin class. a huge thank you to fitlosophy for the fitfuser bottle! So cute! I’m totally trying this. Hands. Up. Emojis.